A non refundable booking deposit of £50 is required along with a completed booking form to confirm all bookings with the balance being due six weeks before your holiday. Should a booking be made less than six weeks in advance, the whole balance is due immediately in order to confirm the booking. 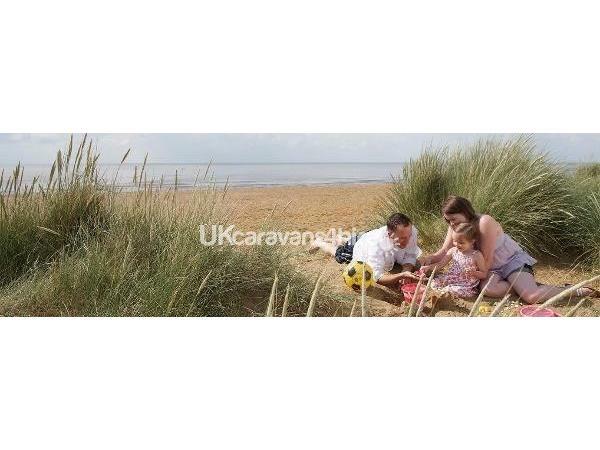 A booking form can be downloaded from our website www.heachambeachcaravan.co.uk or one can be emailed to you upon request. Up to two well behaved dogs accepted by arrangement. There is a small charge for this ( £3 per dog per night, max £15 per dog per week) to cover additional cleaning etc. We also charge a refundable security/damage deposit of £50 per booking. 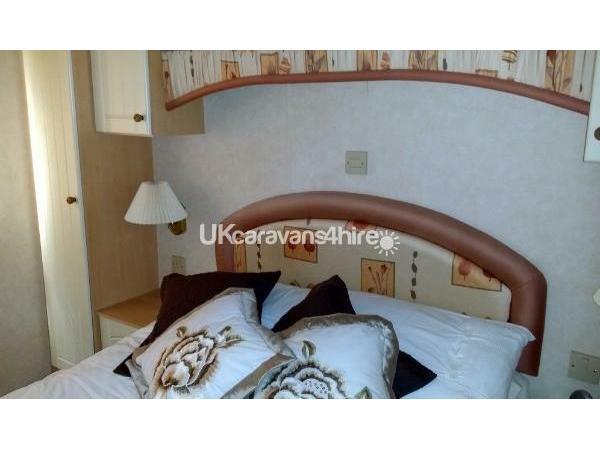 This is refunded once the caravan has been checked for damage/breakages etc. 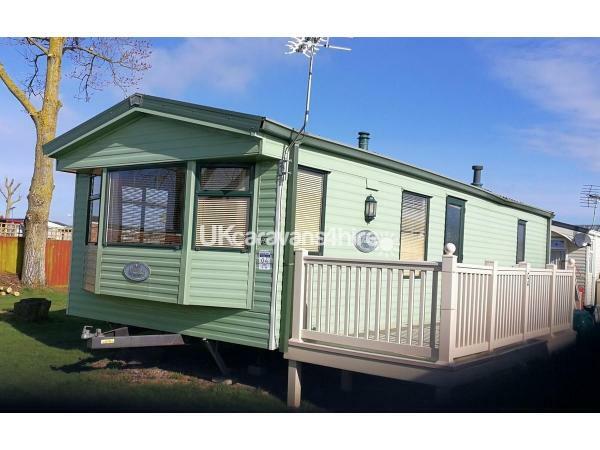 This large comfortable caravan is 35' x 12'. Being 12 foot wide rather than 10 foot really does make a difference especially if you have children or the weather lets you down and you are confined to base! 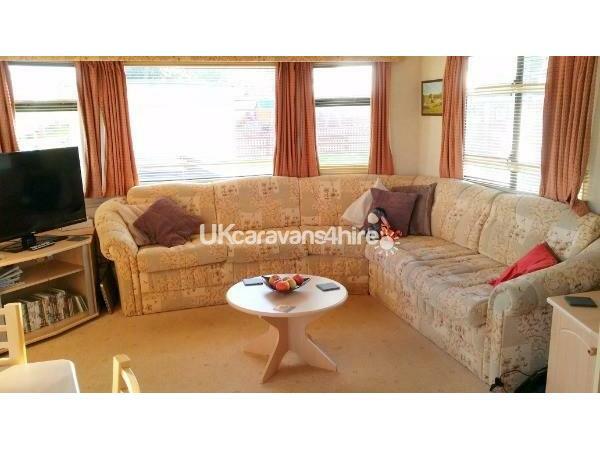 The living area has windows all the way round so it is very light and airy, especially with the light coloured, modern upholstery, part of which contains a pull out double bed to enable the caravan to sleep up to six in comfort. There is a large flatscreen tv and separate dvd player with a small selection of dvds for those days and evenings when you just want to laze around. The dining area has a separate table and chairs to cater for six. 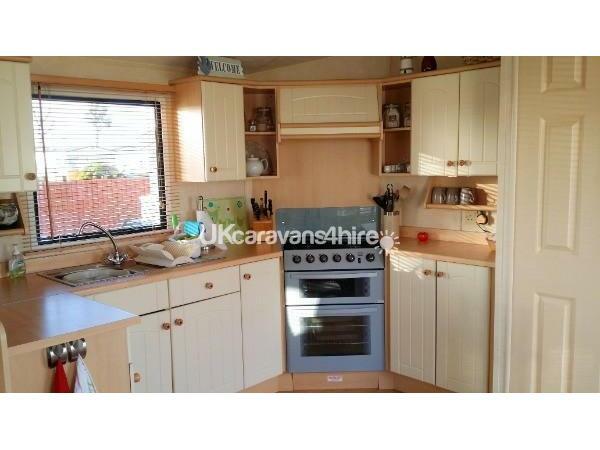 The kitchen area has plenty of storage and ample usable worktop. 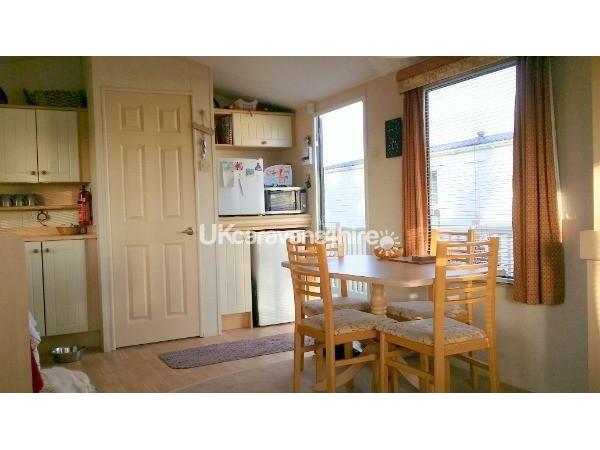 There is a fridge and a separate small freezer, a microwave and full sized gas oven and grill with a four burner hob. There is ample cutlery and all the kitchen equipment you might need to prepare anything from a sandwich to a full Sunday roast! There are two bedrooms. 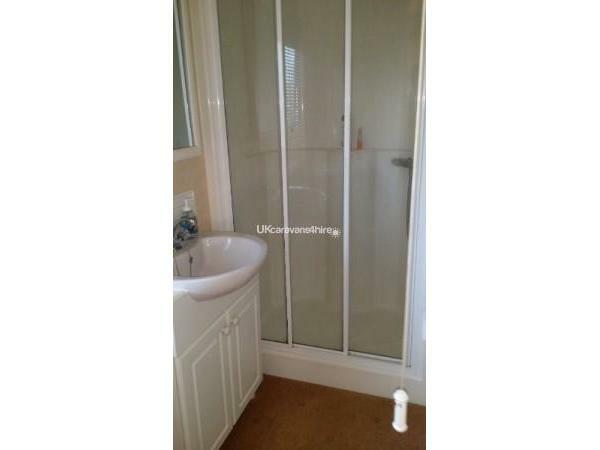 The double has, en-suite access to the combined shower room and loo and masses of wardrobe space and storage. The twin bedroom has its own wardrobe. There is electric heating in both bedrooms and the shower room to help with those chilly early and late season stays. The lounge has a gas fire. 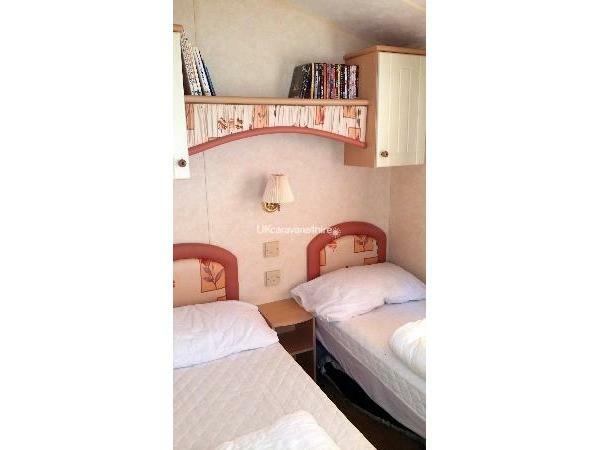 Gas and electricity is included with all bookings. Quilts and pillows are provided. You will need to bring quilt covers, sheets, pillowcases and towels. Hand towels and tea towels are also provided. We do have a high chair and travel cot that is available free of charge upon request. There is a good sized decking area outside with outdoor furniture and parasol for al fresco eating or a private place to enjoy those warm summer evenings. A BBQ and cooking utensils are also provided. 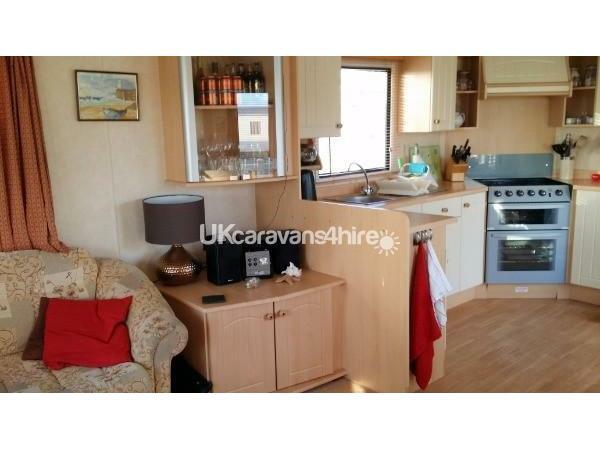 WiFi is Available in the caravan. This is provided by Wifinity and is a chargeable service. Free wifi is available in the clubhouse. We can take up to two well behaved dogs by arrangement and at a small additional cost. 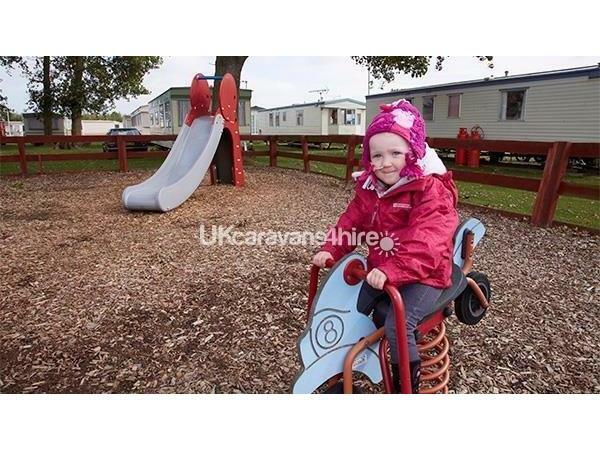 Heacham Beach is a very dog friendly site with excellent dog walking from the caravan door. Dogs are allowed on the beach at all times of the year. Sorry but we do NOT allow smoking in the caravan at any time. Check in time is from 2:00pm and checkout is by 10:00am to allow for the caravan to be prepared for guests following you. 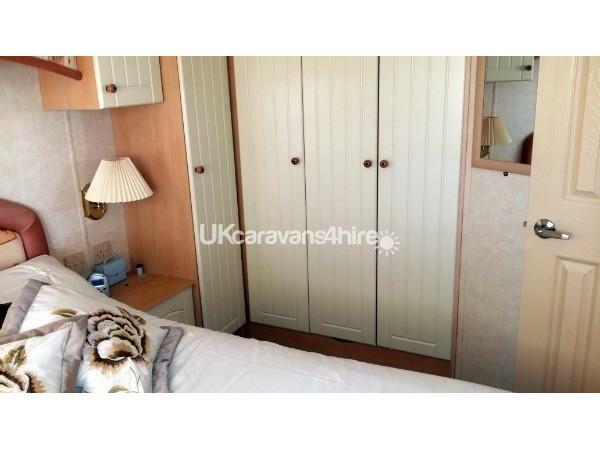 There are NO hidden extras and gas & electricity are included in the price. There will however be an additional charge if you require facility passes which grant access to the pool and the clubhouse entertainment for adults and children. If you require passes please enquire about the cost as this varies depending on the dates of your holiday. We will then make sure they are in the caravan prior to your arrival. Please do not hesitate to contact us if you require any further information. We will do our very best to help. Wherever you choose to stay in 2019 we hope you all have a happy and enjoyable holiday.